Ongoing unrest in the streets of Caracas and major Venezuelan cities, all inspired and fueled on by the United States, and also the OAS (Organization of American States), the Club of Lima (except for Mexico), its European puppet allies, is confusing and dividing the people and has already killed at least 16. The Hybrid War on Venezuela is reaching its climax following the preplanned and coordinated provocation of the US and its “Lima Group” allies to recognize Juan Guaidó as the country’s “interim president” after he swore himself into office on the day that the Bolivarian Republic celebrated the 1958 ouster of a former strongman. As the government supporters march in some areas of Caracas, opposition groups are not only marching, they are actually committing the most outrageous, albeit expected, action: they observe as Juan Guaidó, recently declared president of the in-contempt National Assembly, declares himself interim president of Venezuela! Washington routinely meddles but now has gone far beyond mere meddling. 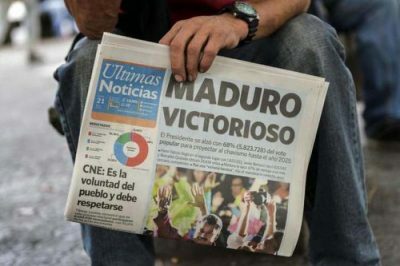 Washington has this day (January 23, 2019) declared that the elected president of Venezuela, Nicolas Maduro, is no longer the Venezuelan president. Washington, not the Venezulan people, has decided who is Venezuela’s president.